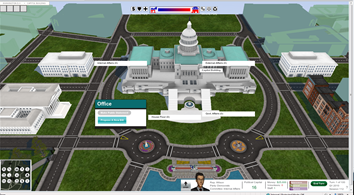 Muzzy Lane, developer of the SGS&C 2012 Best Game Special Emphasis – Adaptive Force Winner for McGraw-Hill, announced on their Twitter last week that “Government in Action” had been nominated for 2013 Massachusetts Technology Leadership (MassTLC) Awards! in the “Innovative Technology of the Year-Ed Tech” category. The MassTLC Awards are the Commonwealth’s most prestigious industry awards program, dubbed the “Academy Awards” of technology. The program kicks off each April with a nomination period. Finalists are officially announced at the July 18 Finalists Reception with winners awarded at the September 12 Awards Gala which draws top executives and teams from companies throughout the state. Good luck to Muzzy Lane and “Government in Action” in the competition for this most esteemed award!